GARDEN CITY, Long Island (WABC) -- A mother from Long Island is leading the charge to pass a law in New York state meant to make things easier for caregivers. Christine Scheppa is a registered nurse, but the current law doesn't allow the government to pay her to care for her severely disabled son. Instead, she has to hire someone else to do it. For Scheppa, there aren't enough hours in a day to earn a living and give her 23-year-old son Vinny the expert care he needs. Her son suffered a traumatic brain injury nearly three years ago after he fell off a skateboard and fractured his skull. He now lives in her home and remains unresponsive and unable to communicate. She says finding skilled Medicaid nursing care has been a challenge, even though she herself a registered nurse and spends long hours caring for other people simply to make enough money to pay for Vinny's care. 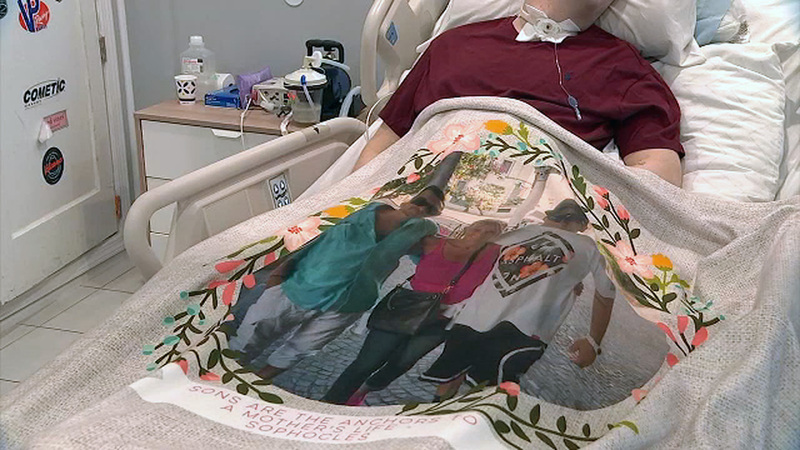 "If that was me in that bed, Vinny would be right by my side," she said. "I'm out of the house more than I'm in the house, so how am I going to be able to help Vinny if I'm not here?" She is pushing for a change in New York state law to allow Medicaid nursing reimbursements for family members. "I brush Vinny's teeth before I brush mine," she said. "He needs his teeth brushed four times a day. I brush his teeth. I bathe him. I do everything that you can for somebody before I do it for myself. I meet his needs before I meet my own, because he's that important to me." State Senator Kevin Thomas says the bill is gaining support. "There are a lot of nurses that are taking care of their family members," he said. "They're sacrificing, going to work at the hospitals just to take care of their family members, and it's just the right thing to do to compensate them." Scheppa wants to be in two places at once, but she knows that's not possible. The change in the law would make it financially feasible for her to care for Vinny rather than relying on someone else. She does want to continue working, but more time with Vinny takes precedent. "I want to do everything I can for my son," she said. "That's the bottom line. He should be with me."